Camping at a motorsport event has been on my bucket list for years! And earlier this year it became a reality. Myself and one of my best friends Lisa decided we would camp at Snetterton for the whole weekend, that was a Friday-Sunday! The week leading up to it we were so excited and then we realised we had to go buy food, drink, and make a list of everything we need to take! First time either of us had gone somewhere without our parents organising. Okay, my dad did give my instructions which we needed so thanks dad! So the Friday rolled around and it was time to pick Lisa up and head to the shops! Although we knew what we wanted, we underestimated we would just snack more than sit down and have meals, although we took two bbq's! Also, we thought 8 small bottles along with two big litre bottles of water would be enough, lets just say by the end of saturday we had 1 litre bottle left. The only worry I had would be as to whether we could get everything in my car as it is so small! But with Lisa's strategic thinking, it all fitted in perfectly! We had everything we needed and we set off on the hours journey for one of the best weekends ever. Getting there was so simple and we were buzzing when we arrived. The queue wasn't very long at all and the people greeting us gave us wristbands which said we were camping as well as a map of the track. Time to set up camp and it was so quick since it was a pop up tent and we just had to put the pegs in, however, we forgot to bring a mallett. This turned out to be a blessing in disguise as we ended up asking the two women in the tent next to us to borrow theirs. Our tent however was not ideal when it rains, which it did on friday night, on and off. We were going in and out of our tent trying not to get wet. This is where the women from the tent (a much bigger and nicer one I'd like to add), Gemma and Hannah invited us to take shelter in theirs while it rained. Meeting them was a game changer for sure. Lisa and I were first timers where as they had been to quite a few and knew the best times to spot the drivers and everything like that. We very quickly got on with them and spent most of the weekend with them. We all had things in common, similar humour and obviously we discussed BTCC and I now fully support Andrew Jordan thanks to them, (as well as some others). So yeah, thats how friday went down. Saturday we were quite chill,walked around and got some photos of BTCC and the supporting series'. I think we were a little bit tired from friday, and the tent was so uncomfy, (not to mention a bit of squeeze). Plus I think Lisa got creeped out because she heard me say 'Plato' in my sleep and mumble a lot to the point she had to see if I was talking to her. Sorry Lisa! In the evening me, Lisa, Gem and Han took a walk through the paddock when most people visiting for the day has left. We some how made it in the pitlane and on the track which was very exciting for us all! And we found a podium and took pictures on it of course. We walked from the start/finish line up to the first corner and it took us as long as it would for the cars to do a lap! We then took a closer look at the kerbs and also found tire rubber left offer from all the action that had gone on that day. Yes, me and Han may well have taken some home, dont judge us okay, you'd do the same. Back at the campsite later on we sat around having a few drinks and then went over to the band which were playing in the camping area, there was live music on friday night as well but we could hear it well from where our tents were. One thing which was vital was to discuss our plans for sunday! Oh and to decide where we wanted to put our chairs. It was finally BTCC race day! Lisa and I got up early (for once in our lives when we aren't at work) and went straight to put our chairs where we wanted them. Luckily our camp site was right next to a place where you could see at least half of the track! We quickly got our chairs up there so we didn't have to worry about losing a space and not having a good place to watch the race. On our way back from doing that we heard Han and Gem get up, so we finalised our plans. They already had chairs up nears ours but they were going to walk about the track more during the races so we arranged to meet later on in the day so the four of us could get in the queue for the drivers autograph session! We had everything down to a T. We knew the drivers we really wanted to find and get pictures with and boy we did that. A few races went by and me and Lisa had lunch (well what food we had left) and went off to meet the others! We got in that queue and it was by the Formula 4 drivers and their autograph session was going on and I have followed Jamie Caroline for a couple years now so I wanted to get his. But, I was scared to go on my own, Han stepped up and came with me and he was so nice and we met some of the others and got theirs too. Looking back I think we must have looked like weirdo's as we were both wearing Pirtek gear and they are one of Jamie's sponsors. We may have looked like crazy fans, oh well, if we did he wont forget us for a while! Patience was a virtue, the queue was getting longer behind us and I was determined to meet Aiden Moffat after trying two previous times and also Andrew Jordan. Okay, and Kelvin Fletcher because sometimes I watch Emmerdale and at that point he hadn't left the show yet. Then the moment we had been waiting for, they were letting us in. Me and Hannah went into fangirl mode squeezing through every gap we could and not letting anyone push in infront of us where has Lisa and Gem were a little more reserved and at times a little bit embarrassed to be seen with us. First up, Aiden! He was one of the first garages so thats where we headed! Mission 1: Meet Aiden finally was completed. I was one happy bunny! Next up to Andrew Jordan who had a bit of a bigger queue but worth the wait. After going to the main two, we went up to the pit wall and looked over at the track and where the smallest queues were. But we couldn't help getting a group selfie!! 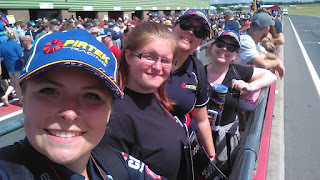 We got in the line for Kelvin Fletcher but when we were two people away they told us it was time to leave the pit lane, but we still got autographs so we went away with something. Then it was time to take our seats and watch some more races! Race 2 and 3 of BTCC was crazy! The big crash in the second race happened right in front of me and Lisa, we couldn't believe it. Thankfully all the drivers were okay! Couldn't say as much for some of the cars but a few involved managed to get out for the last race. For the crash in race 3 we heard it but didnt see it. Luckily we made sure we could see a screen and when they showed replays it just looked horrible! Again, luckily all drivers and the cameraman were okay as a car knocked over the camera stand! Never known that to happen before, hopefully it doesn't again. Every race we watched throughout our stay was exciting and we could not have been more sad to leave! 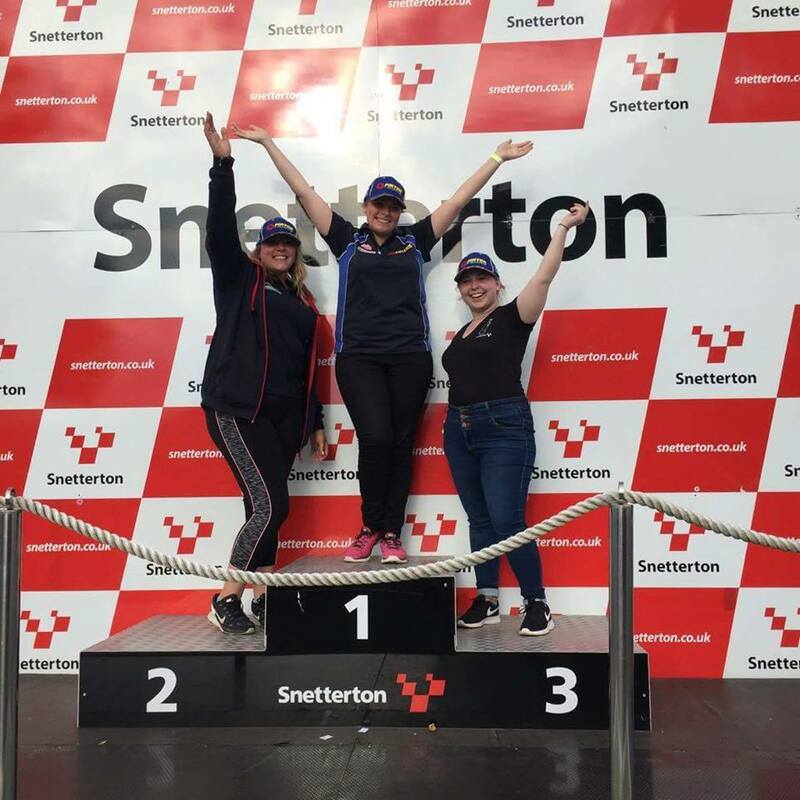 First of all we left a track we ended up loving, I mean, me and Lisa got Snetterton tops! And some not very nice sunburn too. In my defence, I was wearing sun screen but the sun was too powerful! Lisa didn't even bother putting any on, and we left Snetterton more red than we arrived. Secondly, we had become close with Gem and Han quickly, we had all bonded over this experience. So, it was sad to depart from them. However, we will see them at Snett next year and some other tracks hopefully. Fingers crossed! After the last race we packed up the car and said our goodbyes. It wasn't so bad packing the car this time, or maybe it was because we were too tired to care that much. We just missed our beds. We spent the whole journey back talking about how much fun we had and we tried to pick our favourite part but we didn't have one! We loved every second and wouldn't change it for the world. I had only camped once before and that was with my parents for one night and this was a whole new experience. 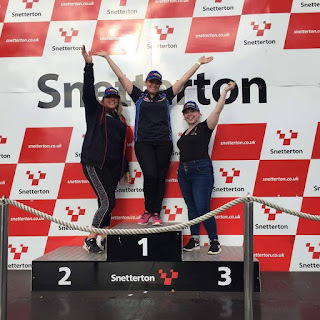 I would recommend camping at a track for BTCC as it is cheaper than most other motorsports, so much fun, you dont just watch one category, you watch so many more, you get up close with the drivers who are all so friendly. I could go on and on. If you ever thought about it, do it, you wont regret it. Just get a big tent! The tent is one thing we are upgrading for next time. And there will 100% be a next time. 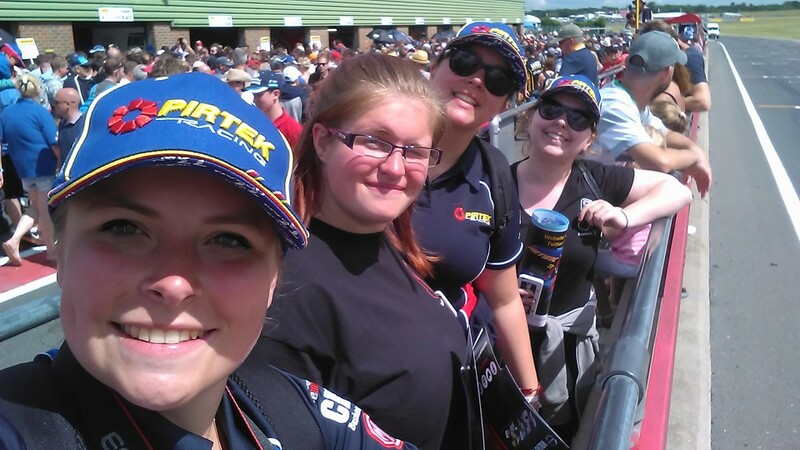 Lisa and I love motorsport a lot and honestly hearing and seeing the cars for three days straight felt like home, was a bit weird the next day when we didn't have that anymore. We clearly have part of our hearts at race tracks. One of the best experiences ever, new friends, new adventures and motorsport. What more could you want? !